Our water gardening tips will make sure that your new garden water feature becomes the centrepiece you're hoping for. Do you admire garden ponds full of plants and flowers that float curiously and beautifully through a pond or stream? 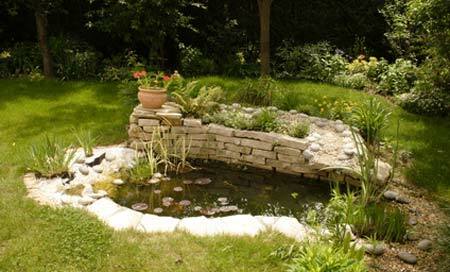 Do you dream of having a water garden full of fish, fountains, and decorative rocks? Water gardening has become the trendy way to garden whether you make your own or enhance a water space on your property and turn it into flowing themes of greenery and colours of all kinds. To understand water gardening, we discuss some practical tips to make it easy to start your own water garden. Placement - First you will need to find the ideal place for your water garden. Because both fish and plants need a lot of sunlight, your water garden should be constructed in direct sunlight away from trees or other obstacles that would block the natural sunlight. Surrounding trees may also shed leaves which will make it a bit harder to keep your pond clean. Type - Consider what type of water garden you want. Do you want to add fish? Will you have garden waterfalls or a fountain in your water pond? Think about what types of rocks and lighting you might want. Remember that to construct a pond, you can use just about anything that holds water, like a plastic tub or basin. Size - Make sure you think about the size of your property before you determine the size of your water garden. You dont want a too-large garden if your property is small and vice versa - keeping the right proportions will be more balanced and pleasing. Seek out the advice of watering gardening or pond experts to help you determine the size. 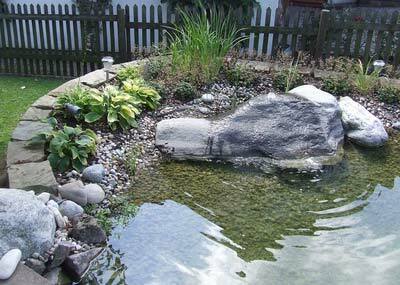 Maintenance - A water garden is great as it may take less maintenance than a conventional garden. Your biggest maintenance concern will be keeping algae out of the water. To avoid algae, don't over feed fish or over-fertilize the plants in your water garden as this can cause algae to grow. Design - Consider what types of plants or flowers you want in your water garden and keep in mind that a good balance of plants and flowers is necessary to create an attractive water garden. Waterfalls - If you like the idea of a waterfall, it will add oxygen to your pond that will circulate air into the water. Fountains - If you are on a budget, a fountain may be cheaper to add to your water garden than building a waterfall and you will still reap the rewards of oxygen with a fountain. Pumps - If you are unsure what size and type of pump you may need for your water garden you need to ask an expert as the size of the pump and the power and electrical usage of the pump will depend on the size of your water garden, so keep these issues in mind. Winter Months - During the winter months don't break the ice that forms on your water garden as this could kill the fish. Instead make holes in the ice by taking a pan of hot water and pouring over the ice to make holes into the water garden. This will remove toxic gases. Keep a Good PH Balance - You will need to check the PH balance of your water garden to ensure your fish, plants, and flowers will continue to thrive. Purchase a PH testing kit from your garden center and ask for help on how to balance the PH in your water garden. If your PH balance is too high, a good trick is to use a mixture of vinegar or lemon juice and dilute them before adding to your water garden. Do not add the lemon juice or vinegar in large amounts. Add it slowly and test the PH again before adding more. A water garden or pond can be a relaxing and peaceful place that is not only beautiful in the day, but through creative lighting, a gathering place for family and friends in the evening. Make sure you do your homework on water gardening and use these water gardening tips to create the garden of your dreams.